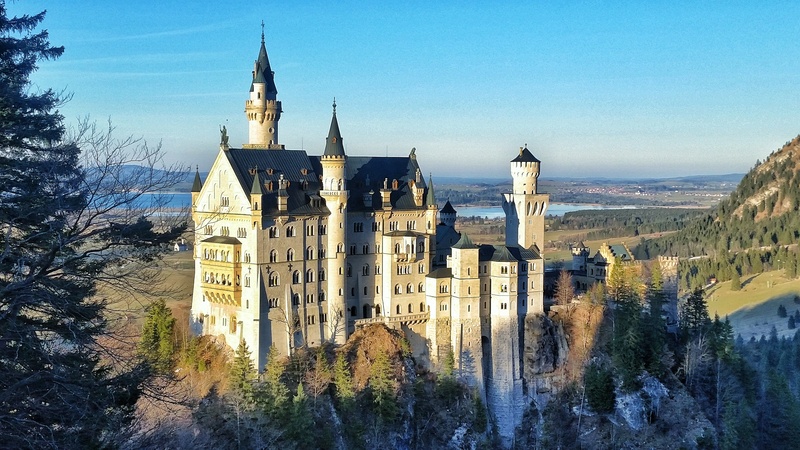 The above statement, which I stumbled upon in the weeks prior to our trip to the Bavarian town of Schwangau, Germany, on the official tourism website, came as quite a disappointment to me. Marienbrücke is a bridge that spans across the deep Pollat Gorge, and provides the most striking viewpoint for the castle that inspired Cinderella’s castle, Neuschwanstein. Neuschwanstein is not an ancient castle by any means. You won’t find here crumbling stone walls, ancient dungeons, or the scars of long forgotten battles. Neuschwanstein was commissioned by Ludwig II, former king of Bavaria, in 1869, with construction being completed in 1892. What the castle lacks in aged charm, it more than makes up for it in sheer flamboyant elegance. Ludwig II was not a subtle man by any stretch of the imagination, and he designed his castle in a way that exuded lavish grandeur while being reminiscent of the traditional German knight style of castle. My extensive internet research for an alternative viewpoint from which to capture the perfect photograph of Neuschwanstein in all its glory came up nil. Sure, I ran across a few suggestions that would give you a decent view of the castle, but nothing like the view I had seen in photographs for years prior to our trip. I reluctantly resigned myself to the fact that I simply wasn’t going to come away with the fantastic images of the castle for which I originally booked this leg of the trip, and decided to just enjoy the beautiful landscape of the area. We spent our first hour in Schwangau taking a leisurely stroll around the wide open fields and farmland at the base of the hills upon which Neuschwanstein rests. The views of the castle from here were pleasant, if a bit distant, and shrouded in shadow, as the sun was as of yet to emerge from behind the towering foothills of the Bavarian alps. 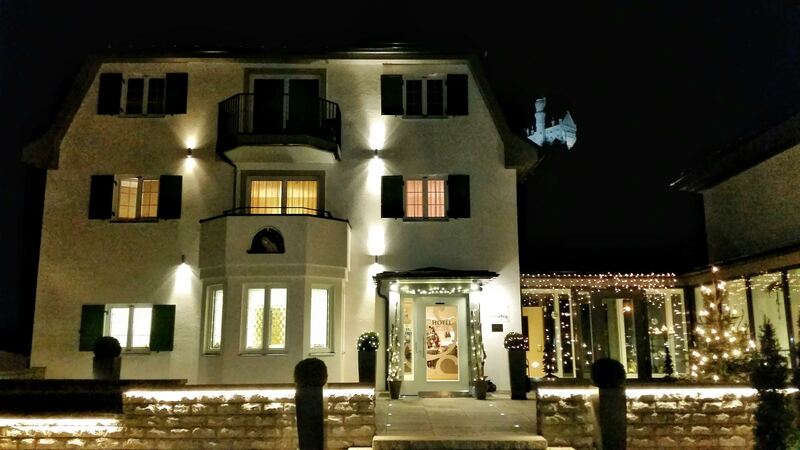 We booked a room in a new hotel just at the base of the castle called Villa Ludwig, and decided we’d go ahead and check in there, and try to get a bit closer to the castle afterward. We had a good view of Neuschwanstein from our balcony, but we were still determined to find some secret trail that would give us the ultimate photographic angle. Off we went, trudging up the steep hill that leads to the castle, passing along the way tour bus after tour bus, and hordes of fellow castle gawkers. This was possibly the most touristed location we’ve ever visited. And for good reason! En route to the castle, we were treated to some nice, up-close views of the facade of Neuschwanstein. As the day got on in hours, we continued our march up the hill toward the castle, when we noticed a wooden fence and a couple of people just beyond it standing at what seemed to be a clearing that looked in the direction of the castle. There was no official entrance into this area, and we instead just slipped between the wooden slats of the fence. Once inside the restricted area, I discovered a slightly beaten path rapidly rising into the heavily wooded area of the hill. I summoned Christina over to follow me, as something about the path just seemed to be calling out to me. We climbed the footpath up through the trees and followed along what appeared to be a long forgotten, once sanctioned trail that obviously had been neglected for many years, before finally coming upon a leaf covered ridge sharply rising up before us. There were maybe 6 or 7 other people sitting on this ridge, cameras all trained in one direction. Could this be the view I had been looking for? As I made my way up to the lip of the ridge, I glanced down and saw the closed off and scaffolded Marienbrucke bridge, from which the best views of the castle are found. “This is a good sign!” I remarked to Christina. As we came to the top of the ridge, there we saw, in all it’s Romanesque glory, the perfect view of Neuschwanstein Castle. This was the view I had dreamed of, and we had stumbled on it by accident. The sun was on its descent behind the mountains once again, and we just happened upon this view at the much sought after “golden hour” of photography, when the sun is at that perfect angle to highlight the subject in just the right way. Within 5 minutes of taking the above photograph, the sun had already fallen behind the mountain, and Neuschwanstein once again fell back into shadow. We stuck around for a bit, sitting upon the ridge, with a vertiginous drop straight down hundreds of feet into the gorge far below us, and lavished in the view for a while. Somehow, luck had been with us this day, and afforded us the greatest glimpse we could have hoped to have gotten at the castle that brought us to this part of Germany to begin with. As we left the ridge and made our way back to the more sanctioned trails, we noticed people frantically running with their cameras, trying in vain to capture their subject before the sun made it a bit more difficult to capture. We directed a few camera-toting groups to our recently discovered spot, but unfortunately for them, they had missed, by minutes, the perfect photographic opportunity. Many of them had spotted that ridge while actually being inside the castle and noticing some people out on the ridge and rushed out to find that very spot before they lost the natural lighting. We don’t always have the best luck or timing in our travels, but once in a while, you’re destined to strike gold, and we certainly did strike gold on this day. That night, we returned to our hotel, in the shadow of the castle high above us, and were happy that things worked out so well for us. I’ve published a follow up article to this post that describes how to find this particular viewpoint. Check it out if here! I’m so glad you were able to get the view and photos you hoped for! Even though the bridge was open when I visited, it was a cold and rainy day and the fog was too thick to see 3 feet in front of you, let alone the castle in the distance. It was still a memorable experience, but definitely gives me reason to return. Thank you! It was an incredible stroke of luck that I caught it! Wow, perfect shots! I thought I had a great shot from the Marienbruecke years ago, but your shot with the sunset takes the cake. Congrats! Thanks so much, Sebastian! It was a totally random and accidental find at exactly the right moment, how often does that happen?? Hi justin! I’m so glad I saw ur blog! It’s inspiring and helpful! And I get what u mean when u go to a place expecting great pictures and deal with some unexpected things so u don’t get the pictures u want…..But then in the end you end up with awesome ones! I also just researched that the bridge is closed so that’s a bummer but after reading ur post I’m a little hopeful to possibly also get some good shots of the castle. I have some questions for u. Did u rent a car and drive around the area? Or did U train/bus? We’ll be coming from Munich. Also is Hohenschwangau and Linderof in close proximity? Can you walk them? And how is the parking, is it full/difficult to find? We plan on going end of March. Is the drive (roads) to get to these places pretty busy/safe, etc. Oh and it is best to go in the morning for better lighting? Sorry for all the questions! Hi Ellen! Yes we rented a car through EuRopcar in Freilassing, Germany. We stayed in Salzburg, Innsbruck, Schwangau, Fussen, and Heidelberg, and drove to all of our destinations. It is definitely best to have your own car rather than to rely on public transport because it gives you so much more freedom to go when and where you want, and in the end, is probably about the same in cost as it would be for bus and train tickets! We arrived in Munich as well – took the train to Freilassing, rented our car there, then drove into Austria. In the city of Schwangau, both Neuschwanstein castle and Hohenschwangau are very close to each other, and easily walkable between the 2. I’m not sure about Linderhof, as we didn’t go there. There was ample parking in the town – it is a very tourist heavy area, so they make sure and have plenty of parking available. It’s a very small village, so you can’t miss the massive parking area. We stayed at a hotel just below the castle, so we just parked at our hotel’s garage. The roads on our way there were very safe, easy to navigate, and extremely scenic the whole way! Be prepared to stop along the way at the pullouts for photo ops In March, your best bet will be to visit in the afternoon, as in the morning it takes the sun a while to rise above the mountains that surround the area, so the castle will be in shadow until the sun peeks out. Hope that helps, let me know if you have any other questions! 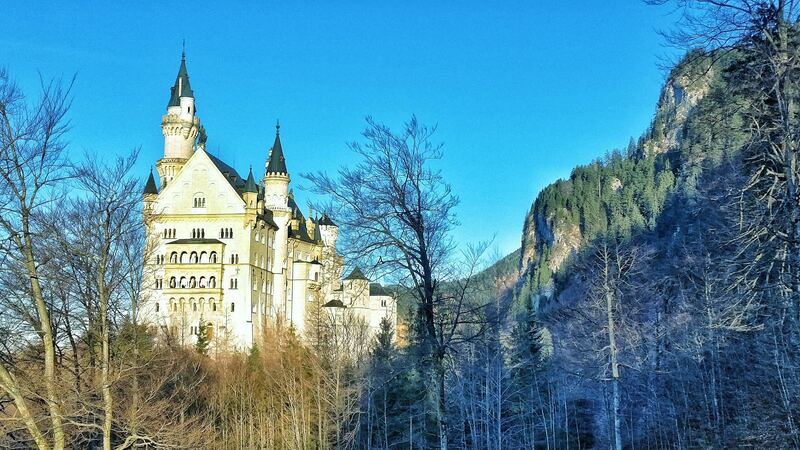 We also visited Neuschwanstein last month with the same glorious weather you had. Thank you for your picture from your hike up the mountain. We will add it to our pictures for our trip. After we completed our visit by about 2 pm, we drove to the Linderhof castle through gorgeous Austrian forests and lakes; Linderhof is small but very beautiful inside. Too bad you didn’t get to see it. And I agree that travelling by car is the best to see the surrounding country side, including be able to find beautiful places while driving that are not shown on normal tourist maps. I really wish we had a chance to have seen Linderhof, I’ve heard such great things! Is it possible that we could get for our personal trip files digital copies of those two hillside photos? (We also were in Salzburg for Christmas; it was just lovely.) Thanks. Sure Bruce, which 2 are you referring to exactly? 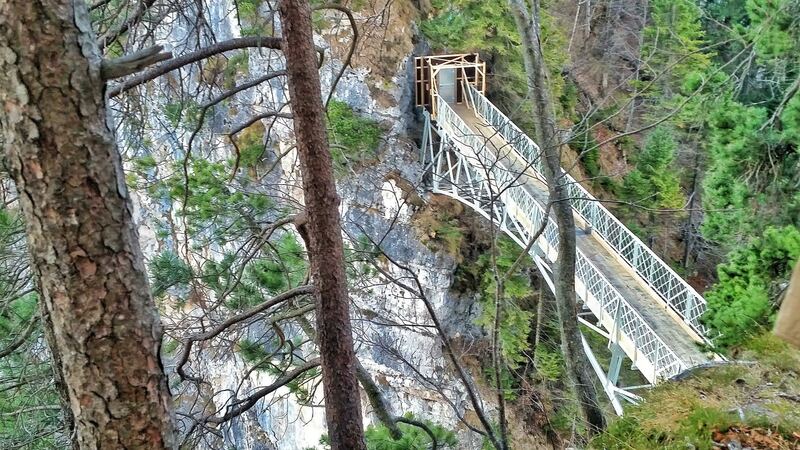 i was thinking on visiting Neuschwanstein from Stuttgart this Saturday (sunny sunny day after snow week), but i just discovered that the Marienbrücke is closed…it was really disappointing! The idea was to arrive early to the castle and enjoy the outside views (don’t interested on the interior tour) between 10-13h, and after that going to Zugspitze (1h ride) for enjoying panorama views on the same Saturday afternoon before the sunset! I would say it was around 13 – 15h that the castle was illuminated by the sun, just a very short window of opportunity! It was completely free of snow when we arrived, and I feel that if there is a significant amount of snow on the ground now, the view point we found might be inaccessible or dangerous. It was very much off the beaten path and right on the edge of a massive vertical drop. You might find your day better spent at the Zugspitze and the Tegelbergbahn (where you can also get good views of the castle from the cable car) if it is a lot of snow on the ground. If it’s not too snow covered, I’d say it is worth it! That’s my thoughts on it anyway! 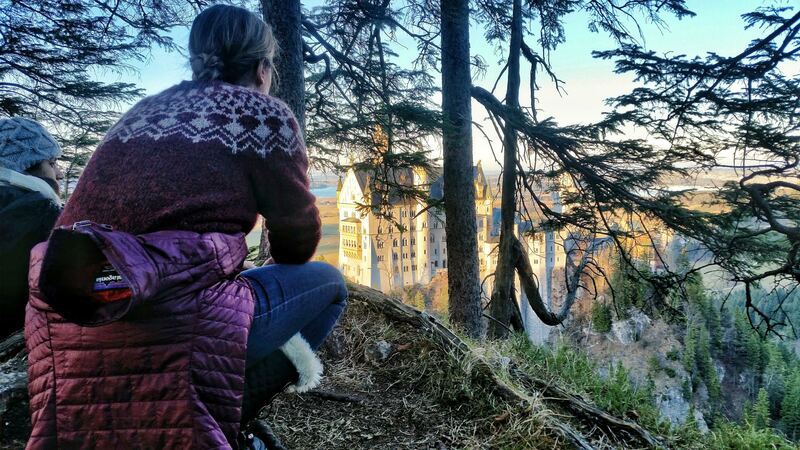 What a perfect place and one of the most beautiful castles in the world. Great shots. Oh, the fairy-tale castle that I never can remember the name of! I’ve always wanted to go but I’m afraid that when I get there one day it might not be as good as I have imagined. I would have been doing the same thing as you..searching for a way to take the photo! It can be such a bummer to visit a place only to find out something you wanted to see is closed or under renovation. I’d really love to visit Neuschwanstein. Any word on when the bridge will reopen? 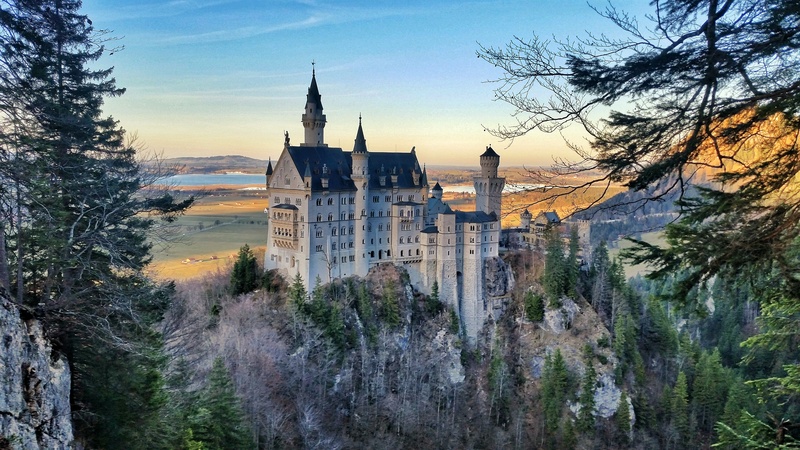 We visited Neuschwanstein a few years back but certainly did not get the viewpoint you did. I had no idea that bridge was even there! I’ve always wanted to see Neuschwanstein Castle. It’s probably the closest I’ll come to being a Disney Princess. While I love the sentiment and emotion you capture in this post, it pains me that the pictures are taken with a phone camera. Thanks for the directions! Very useful. At the moment the marienbrucke is under construction (again), and everything is closed off, however, it seems that once forgotten, secret trail had become a second marienbrucke. Many people climb over/under/through the wooden fence or shove the construction fence aside to get to this lookout ridge. I was here yesterday and saw at least 50 people doing that in just 15 minutes time. So it seems it has become the new selfie spot.